New York: Alfred A. Knopf, 1934. Hardcover. Very good/good. Association copy, inscribed by Cain to Miriam Geiger. Second printing. Very good in a good dust jacket, unclipped ($2.50), closed tear with contemporary tape repair on the verson, rubbed at the edges, toned at the spine with two circular dampstains near the title. Black clowht with silver lettering and designs. Firmly bound with a slight forward lean to the spine. Cain's second novel, the successor to "The Postman Always Rings Twice." A story of a love triangle that spans across Mexico, Hollywood, and New York. Like all good Cain dramas, "There are tenderness and beauty in the book, and also murder and vice." Miriam Geiger was a writer in Hollywood during the early 20th century, with credits on National Velvet, Lassie, and others (IMDB). When Orson Welles was first planning "Heart of Darkness," he "hired Miriam Geiger as one of his first guides to the Hollywood 'language' of film" (Lebo 24). She was again hired by Welles to serve as a research assistant for his unfinished project "It's All True" (Benamou 46). 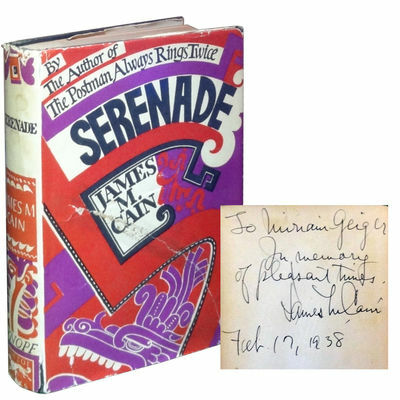 It's most likely that it was her work in Hollywood that Geiger came to know Cain, ultimately leading to his inscription, "In memory of pleasant times."